SUPER TEEN: Arhata Magavi of Karnataka on her way to setting a record in the 100m butter fly stroke in the 63rd Senior National Aquatic Championship. Call this a classic feat in India’s swimming history. Karnataka’s new swimming sensation, the 15-year-old Arhata Magavi created history at the LNCPE swimming pool in Thiruvananthapuram on Wednesday evening by setting a national record in the 100 m butterfly stroke in the 63rd Senior Nationals Aquatic Championship, 2009. In a thrilling two-lap race on the third day of the championship, the teenager from the Basavanagudi Aquatic Camp (BAC), Bangalore came up with a stunning performance defeating Richa Mishra, the five time best swimmer award winner. 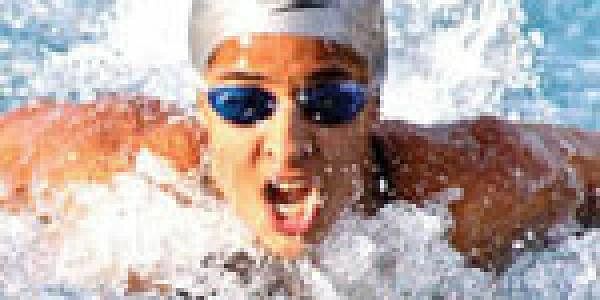 Arhatha has swum to glory smashing the record of Richa Mishra of Police team, which was set during the year 2003. Arhatha clocked 1:03.24 while Richa, who came second in the event managed to better her earlier record time of 1:04.81 with the time of 1:04.52. ``It is a great feeling. I have just started breaking records,’’ said an excited Arhatha, the tenth standard student of the Baldwin Girls High School, Bangalore. The precocious swimmer, who specializes in butterfly stroke has now clinched four gold medals and a silver medal in the 63rd senior nationals - two gold and silver in individual events and two gold in relay event. Arhatha, who set a new championship record in the 200 metre butterfly event on Tuesday, still has two events to go in the championship. ``Breaking Richa’s record is a little difficult and she has done that quite well. So, for me, (Arhatha’s) achievement is very , very special,’’ said Pradeep, the swimming coach of Arhatha at the BAC. Arhatha, who started swimming when she was seven, dedicated the gold medal to her coach, father and her family. Earlier this year, Arhatha had clinched a silver medal in the Asian Youth Games held in Singapore. Meanwhile, Rehan Poncha continued his brilliant run with a new meet record in the 400m Individual Medley event. Rehan, who like all champions makes swimming look simple, took a considerable lead in the second lap itself in the eight-lap event. Rehan clocked 4:30.13 breaking his own record time of 4:33.59 set during the year 2007. The men’s 100m freestyle event witnessed a close contest between two ace swimmers of Karnataka. In the end, sprinter D’Souza Aaron Agnel clinched gold, bettering his own earlier record set in 2008. Agnel clocked 51:43. While, his team mate Ashwin Menon finished with 53:58. In the 800m Freestyle, Kanchi Desai of Maharashtra won the gold with the timing of 9:41.21. At the end of the day, Karnataka maintained their top position with 161 points. Maharashtra and Police are at the second and third spot with 93 and 64 points respectively. In Waterpolo, Kerala thrashed Delhi 15-0. Men: 100M freestyle: Aaron D’Souza (Kar) 51.43, 1 NMR . Old record: 51.93 (Aaron D’Souza, 2008); Ashwin Menon (Kar) 53.58, 2; K Mani (RSPB) 54.63, 3. 400M individual medley: Rehan Poncha (Kar) 4:30.13, 1. NMR . Old record 4:33.59 (Rehan Poncha, 2007); Merwyn Chen (RSPB) 4:49.58, 2; Mandar A Divase (Pol) 4:51.52, 3. 4X200M freestyle relay: Karnataka (Rohit R Havaldar, Ashwin Menon, Rehan Poncha, Aaron D’Souza) 8:13.94, 1; Police (Arjun Muralidharan, C H Vinay Krishna, Guno Singh, Mandar A Divase) 8:19.52, 2; RSPB (SSP Nayar, Praveen Tokas, G Mohan, K Mani) 8:27.15, 3. Women: 800M freestyle: Kanchi Desai (Mah) 9:41.21, 1; Sushaka Pratap (Kar) 9:47.99, 2; Aditi M (Mah) 9:50.12, 3. 100M butteryfly stroke: Arhatha Magavi (Kar) 1:03.24, 1. National record. Old: 1:04.45 (Richa Mishra, Police, 2007). NMR . Old: 1:04.81 (Richa Mishra, 2003); Richa Mishra (Pol) 1:04.52, 2; Vandita Dhariyal (Guj) 1:05.13, 3. 4X200M freestyle relay: Karnataka (Shubha C, Pooja R Alva, Sneha T, Arhatha Magavi) 9:09.68, 1; Maharashtra (Arti G, Lekha K, Aditi M, Kanchi D) 9:30.81, 2; Tamil Nadu (VK Meenakshi, M Raghavi, Sushmeeta, Anusha M) 9:41.97, 3. Men: Maharahtra: 7 bt Bengal: 1. Women: Karnataka: 5 (Varshini Gubbi 3, Malvika Gubbi 2) bt Manipur: 0; Police: 6 bt Bengal: 1; Kerala: 15 bt Delhi: 0. Diving: Women: 3M spring board: Hruthika S Sriram (RSPB) 185.85 points, 1; Karishma M Mohite (Kar) 168.70, 2; Sushmita V (Goa) 163.80, 3.